Redfin is a full-service real estate brokerage with agents in 22 major metropolitan markets throughout the U.S. At Redfin, engineers and real estate agents work hand in hand to make the entire process of buying and selling a home easier and more efficient for consumers. Redfin has a team of experienced, full-service real estate agents who are advocates, not sales-people, earning customer-satisfaction bonuses, not commissions. Home Price Tool: Enables customers to estimate the value of their home based on the same information used by real estate agents. Instant Alerts: Texts or emails when new homes are listed or when prices drop. Search by School: Shows all the homes for sale served by a certain school zone. Offer Insights: Stories and stats from Redfin agents about the offers they’ve won or lost. Tour Insights: Notes from Redfin agents about the homes they’ve toured. Price Whisperer: A service that helps potential home sellers determine what buyers are willing to pay for their home through targeted emails. Deal Room: A roadmap that guides homebuyers through the entire process, from choosing an agent, touring, financing, making an offer, closing, and beyond. Redfin agents are paid based on customer satisfaction, not commissions. In a nutshell, they are paid to be on your side. Redfin.com is one of the most highly trafficked brokerage websites in each market it serves. As a result, Redfin agents don’t need to spend any time looking for new business; their clients come to them through the website. 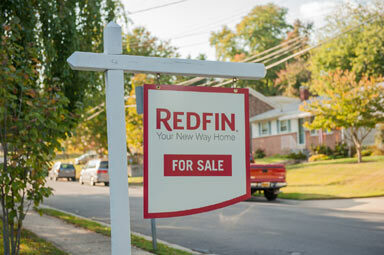 Redfin passes along a portion of the savings to customers. Depending on your location, the seller of a home typically pays a commission of 4.8% to 6%, which is split between the seller’s agent and the buyer’s agent. Traditional brokerages keep all of their commission. When you buy with Redfin, we share a portion of our commission with you so you can get thousands of dollars back without sacrificing service. In addition, people who list their home with a Redfin agent save up to 1.5 percent in fees, depending on the selling price of the home.